Cheap flip flops make it easy to get through the summer months. Whether you spend a lot of time at the beach, by the pool, walking the mall or just hanging out with your friends, flip flops are a summertime staple, especially in hot climates. Because much of your summer wardrobe may be casual and laid back, you'll probably want shoes to match and there are few choices as laid back as flip flops. Not only can you find this footwear in your local shoe store once the weather heats up, you can often find flip flops in drug stores and discount marts as well. If you're visiting a popular tourist destination-Disney World, for instance-you'll be able to find a variety of flip flops in just about any store located in the area you're staying. Flip flops aren't just for beachgoers anymore, although you're more likely to see them in certain environments over others. People have taken this casual shoe and made it acceptable to wear almost any place. Usually, if it's appropriate to wear a casual sandal, flip flops are also suitable. In some tropical locales, you might see people wear flip flops year-round instead of only in the summer. One thing cheap flip flops don't offer is support. If you need arch support or specially designed shoes to keep your feet healthy and comfortable, flip flops are little more than a barrier between your feet and the ground. 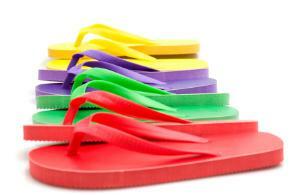 You can find flip flops in a multitude of colors. While the simplest pair will be little more than a sole and a rubber thong to fit between your toes, you can find even cheap pairs with embellishments like sequins, flowers, animal print and metallic colors. Flip flops are made for boys and girls, as well as for adults. There are many choices available as far as color and style go. Cutoff shorts, tee shirts and flip flops go great together, but you can also sport these shoes with a casual summer dress. Because flip flops are so easy to slip on your feet-and also easy to slip off when you want to dig your toes into the sand-they're practically a summer must-have item. They're perfect to pack into your bags for weekend getaways as well as long vacations. If you forget to pack them, however, you'll probably be able to find inexpensive offerings at your destination. When buying cheap flip flops, not a lot of care is expected. These are some of the easiest shoes to care for, requiring little more than a rinse off if you get a lot of sand on them. Some people see no need to care for their shoes at all since they may be tossed out at the end of summer. Whether flip flops signal the beginning of a long summer, a long awaited vacation, or are your footwear of choice year-round, with the availability of cheap offerings and a variety of selections, you can probably outfit the whole family in these shoes for less than dinner at a restaurant. Enjoy the hottest months of the year in these easy-care, easy-wear shoes.